This product is the idea to copy your order from One MT5 to Other MT5 in a single computer. It could helpful to run manual trade in one Broker and also expand to many Broker as well. Bot need run 2 account's terminals in a single computer to share a data file in the share-common directory. Using with WebRequest Download, then can work a single account in one computer to a single account in another computer. The bot can multiply the order size in the slave account. It is a single bot, to be act as Master or Slave. It can use one Master to many Slaves. Using Input Login same to Account Login, then It will act as MASTER. 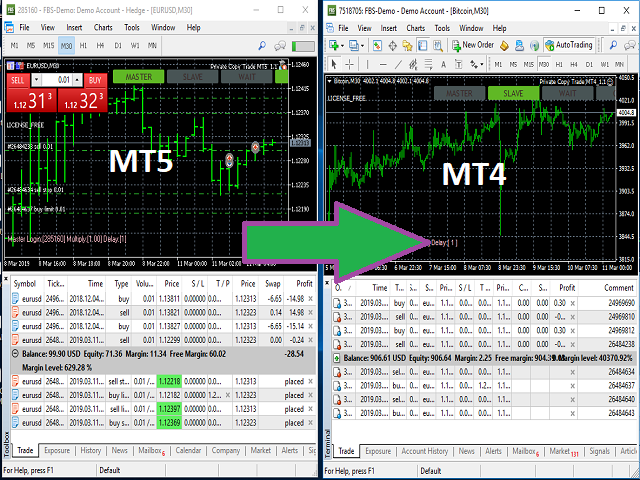 Using Input Login different to Account Login, then It will act as SLAVE and looking to copy the trade from MASTER's Account login. Using FTP it can send trading records from any trade terminal to where can copy trade far away. 1) Send a trade record binary file to our web-server via ftp-server.